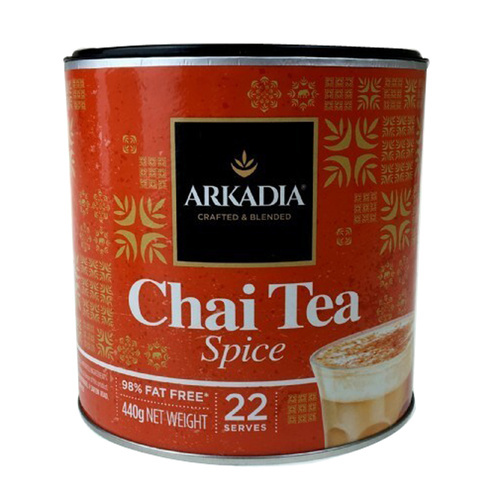 Arkadia Spice Chai is a traditional aromatic Chai tea recipe savoured in India for over 5000 years. It is a delicious secret blend of black tea and exotic spices with a touch of sweetness . Simply add hot water or milk. Arkadia Spice Chai Latte Tea is a natural product that is totally free from artificial flavours and colours. Spice Chai is the most popular Chai in Australia with over 40,000 cups a day served in Australian cafes. This 440g Arkadia Chai Spice pack equals around 24 plus serves.